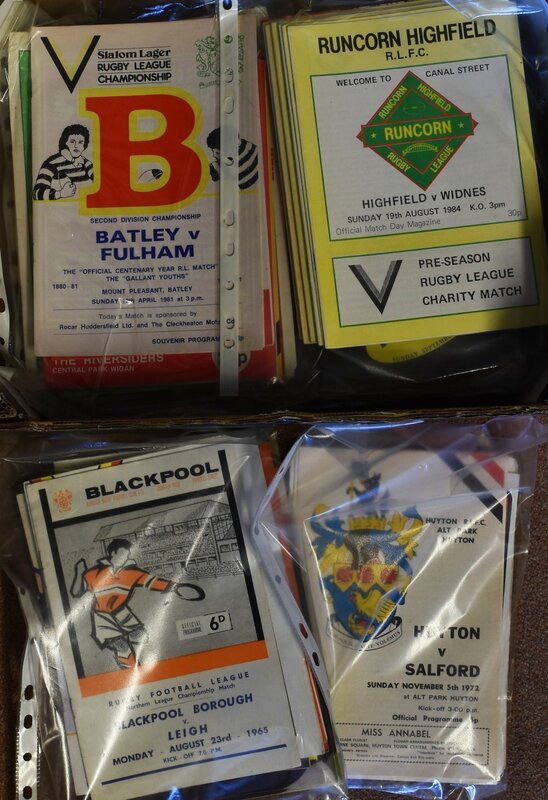 Collection of various rugby league match programmes from as early as 1947 up to the 1980’s - to incl 1947/1948 Belle Vue Rangers v Salford (Lancs Cup), 1961/62 Liverpool City v Whitehaven, 1965/66 Blackpool Borough v Leigh, Huyton homes 1972-1981 (15), 1980/81 Fulham (1st season) v Wigan (1st match) plus further Fulham (H) 1980/81 (12) and (A) 1980/81 (10), 1980/81 Oxford University v Cambridge University (at Fulham), 1980/81 Great Britain U24’s v New Zealand (at Fulham). 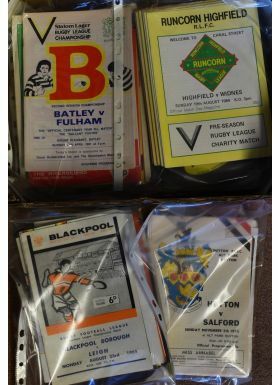 Also Runcorn Highfield 1984/85 (1st season) v Widnes (1st match) plus further homes (9) and aways (4), 1981/82 Dewsbury v Carlisle (1st season) plus Rothmans year books 1984/85, 1987/88 plus others. Worth an inspection. (A Lot).